One of the better meals of my life. Much has been written about Charlie Trotter’s closing his restaurant after 25 years in operation. But the menu is delightful. The kitchen tour afterwards surprised me. It was cramped and in a small space, and it was a wonder that so many dishes were able to come out of that small kitchen. 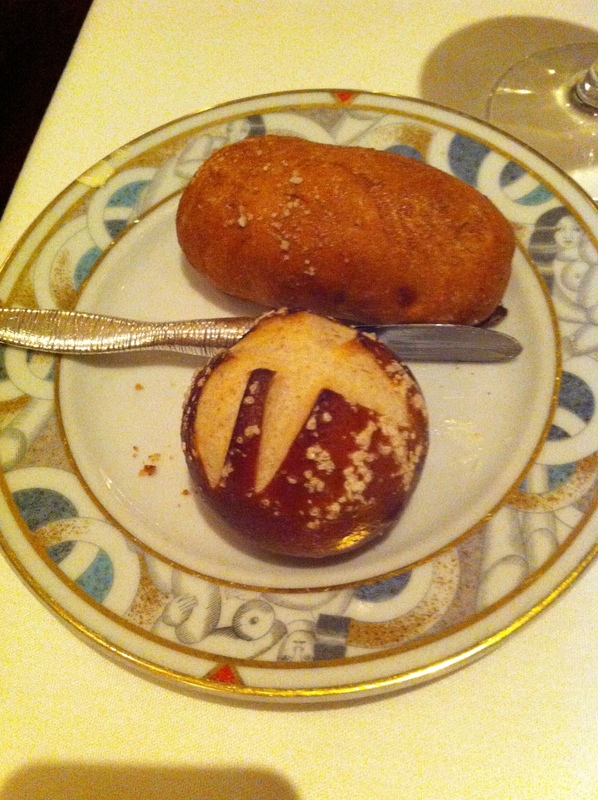 One of the breads was incredibly delicious. It was a crispy bread drizzled with maple syrup on the outside, and had tender bacon cuboid strips on the inside. I dub it the “Baconator”. Boston mussels, sweet pea sauce. Avocado-lime sorbet. hamachi with squid ink. Incredibly tender, white hamachi. King salmon and myoga (Japanese ginger) paired well. King salmon lightly seared to perfection The salty horseradish and sweet potato lent body to the dish, but the horseradish amount could have been pared down. It ended up being a bit starchy for my taste. A crisp lightly caressed of duck fat appeared on our slices of duck. Coconut, Chocolate were supporting actors for this play. Wine was deliciously complex, as if all the noxious fumes of uncracked petroleum were transmogrified into sugars. Tender veal. The lamb had a background sourness that only looking at the menu in hindsight I realised was espresso. The pea ravioli next door (you can spot the dark green ravioli peeking out behind the cracker) was delicious. Wine tasted like a generic red. The tart was made like a baklava. An ode to raspberry. The Tonka Bean sorbet tasted like an artificial strawberry candy, but the riviera cake sandwiching the lemon balm was divine. Verdict: A fantastic meal, a great triumph. Some of the best classical cooking in Chicago.